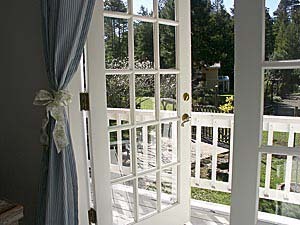 La Petite Maison is a beautiful country cottage five minutes from the Mendocino village and coastline. 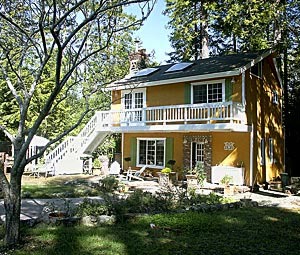 Located on a secluded five acres and surrounded by captivating redwoods, meadows, and lovely gardens, this charming cottage offers complete relaxation. 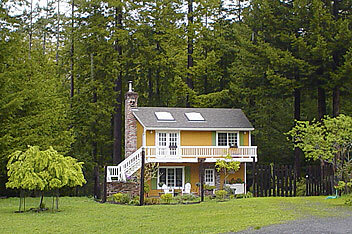 La Petite Maison is the perfect retreat for any couple or individual looking for a delightful residence while visiting the Mendocino coast; famous for its beautiful forests, beaches, rivers, state parks, botanical gardens, and vineyards. La Petite Maison was recently renovated in a sunny provincial style that's soothing and filled with light. This, combined with gorgeous location, moderate climate, and relaxing quietude makes the cottage sublimely relaxing and romantic.